It was indeed a difficult assignment for a newly ordained Salesian priest. It involved leaving the security of an established Salesian Presence in New York and a planned academic future, to travel with an elderly infirm Superior to the Great South Land of Australia: an island continent of which he knew very little. Fr Michael Maiocco, not an easy traveller, found the long train journeys and ship voyages involved tremendously difficult. On arrival in Australia he quickly took up the challenge of establishing a Salesian Presence, searching for a location, accommodation and the best apostolate for a future community being organised and sent over from Europe. Thus, he regarded his stay in Australia as temporary. It was not to be. He remained and later became with Fr Bortolo M Fedrigotti the foundation of the Salesian Presence in Australia. Many years have passed since his early death at 42 in 1942. Since then his memory has centred around his role as an agriculturalist: he was far more than that. An academic, a classical scholar and an outstanding musician, he was also gifted with an impressive personality. Michael Maiocco was a man who attracted people to himself quite unconsciously with his friendly, caring, smiling and encouraging approach. His eager availability for priestly presence in the Archdiocese gained him the friendship and respect of the Archbishop and many clergy. Most of those who knew and loved him have long since passed to the Lord, yet it is truly amazing that their children still recall the stories about ‘Fr Michael’ that their parents have passed on to them. 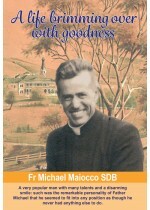 Here then is the life story of Fr Michael Maiocco: a life brimming over with goodness.